Step back in time for an afternoon cruise on a magnificent square rigger tall ship! See the iconic Sydney Opera House and Sydney Harbour Bridge. There is no better way to cruise this awesome harbour. Do you have a couple of hours to spare in the afternoon and wish to see Sydney Harbour and its iconic landmarks aboard a 1850's style timber tall ship. 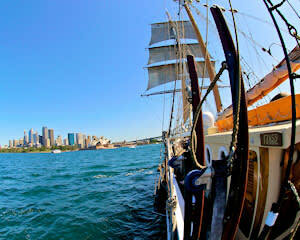 Take a trip back in time and sail past some of Sydney harbour's finest attractions. From the Opera House, Harbour Bridge, Fort Dennison, Kirribilli House, Luna Park, Taronga Zoo, Admirality House and the many million dollar waterfront properties that hug the shoreline of this picturesque harbour. The tall ship is a magnificent square rigger that has three masts reaching over 24m high. This experience can be as interactive as you wish. If you'd like to heave on a rope and help set the sails, you can. Otherwise you can simply sit back, relax and enjoy the entertainment provided by the crew, all of whom are at your service. The vessel served as flagship of the Bicentennial First Fleet reenactment voyage from Plymouth, England in 1988 and is now the last of these heroic ships to remain on Sydney Harbour. 200 years ago, a timber sailing ship was the only way to discover Sydney Harbour. And it still is! 'Southern Swan' is a three masted barquentine built in Denmark in 1922 from Danish oak frames. Southern Swan regularly crossed the North Sea as a grain carrier between Denmark and Greenland for the Tuborg Beer Company until 1969. With ice being a constant hazard in these far northern waters, the ship's bow was strengthened during the initial construction to cope with any light ice work. She was purchased in 1969 as a private vessel and extensively refitted to make extensive ocean voyages, including service as a sail training vessel with the Royal Canadian Sea Cadets. She participated in the 1982 Tall Ships Race from Philadelphia to Portugal. In 1986 after appearing at the World Expo in Vancouver, Southern Swan sailed to England to join the Australian Bicentennial First Fleet Re-Enactment for the historic voyage to Sydney. “Southern Swan’s original name was ‘Mathilde’, then ‘Pacific’ , then ‘H C Andersen’ , then 'Svanen’ , and finally ‘Southern Swan’ . Had a wonderful experience even though it was raining and we were soaking wet! Had a fantastic time. Something truly to remember. We were absolutely pleased with the service from beginning to end. We had a NZ girl meet us, she was very welcoming & helped us with any questions. We met Tom he was great! He held our interest as we were very impressed with his knowledge of the area. I was disappointed i didn't have enough battery left on my phone, to record it all. Loved it we had a great time!? ?